ADDIS ABABA , Jun 6 2013 (IPS) - Despite speculation that the first anti-government protest in eight years, which was held this week in Ethiopia’s capital, Addis Ababa, might signal new levels of political tolerance by the government, leaders of the political party that organised the protest say this cannot be further from the truth. “There has been no change since (the rule of late Prime Minister) Meles (Zenawi). They are still totalitarian dictators who rule this country like control freaks,” Yilkal Getnet, chairman of the opposition Blue Party, told IPS at the party’s headquarters in Addis Ababa. Yilkal explained that his party had told the government they would organise a demonstration during the African Union’s (AU) 50th anniversary summit, which took place here from May 25 to 27, if they were not granted permission to hold a protest after the event. “We told them, if you don’t give us permission, we will do it anyway. You can do whatever you want, you can kill us, you can arrest us, you can take whatever measures you want. 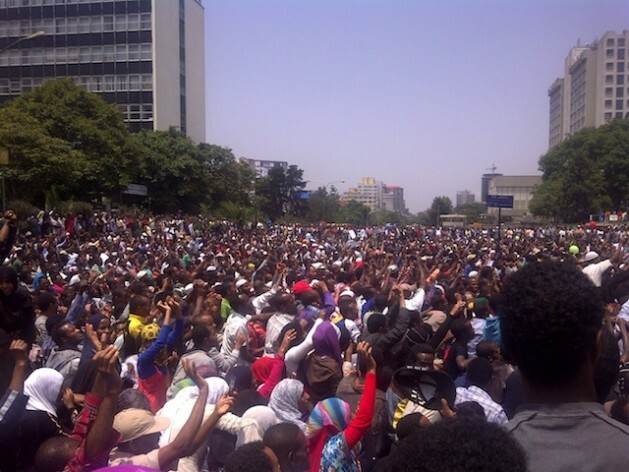 This is our constitutional right, this is the very fundamental right of all Ethiopians,” said Yilkal. At the Jun. 2 protest, the first major anti-government rally since 2005, thousands turned out, chanting “freedom” and calling for the release of political prisoners. The Blue Party also demanded the release of journalists, reformation of government policies in order to combat high unemployment and an end to state interference in religious affairs. They also asked the government to pay compensation to communities displaced by development. According to rights watchdog Amnesty International’s Annual Report 2012, Ethiopia has long “used criminal charges and accusations of terrorism to silence dissent.” And a number of journalists and political opposition members have been arrested and charged with various offences, including terrorism and treason. “Repressive legislation effectively prevented human rights organisations from functioning. Large tracts of land were leased to foreign companies, leading to large-scale displacement of local populations. Construction continued on a dam which could affect the lives of half a million people,” the report stated. The fact that this week’s protest was allowed to take place without any police interference has left some analysts speculating that it could be the sign of a more lenient stance towards political opposition in this Horn of Africa nation. However, according to Hallelujah Lulie, a political analyst from the Institute for Security Studies Ethiopia, it is too early to tell whether this is a sign of a changing attitude within the government. Following the 2005 announcement that the ruling Ethiopian People’s Revolutionary Democratic Front (EPRDF) had won another term of office, thousands of protestors took to the streets to voice their discontent with the election results and the government’s continued rule. The EPRDF has been in government since 1991 and during the 2005 elections it appeared as if the opposition Coalition for Unity and Democracy and the United Ethiopian Democratic Forces would win. Riots took place in protest as pro-government supporters and police battled with the anti-government protestors. Countless demonstrators were arrested and since then little public dissent has emerged. Many of the leaders of the Blue Party emerged from the 2005 protests. Yilkal, who graduated as an engineer, was a youth activist at the time, supporting another opposition party. He said the government put him in a military concentration camp for three months, and then in prison for a further three months. However, Getachew Reda, spokesman for Ethiopian Prime Minister Hailemariam Desalegn, said demonstrations have always been allowed in Ethiopia and permission for them is not necessary. Instead, a notification must be given to the local authorities, so they can organise the logistics needed for the protests to take place, he said. “It was very cynical to demand to protest during the AU 50th anniversary when we needed all our security to focus on the AU celebrations,” Getachew told IPS. The official said there was a misunderstanding that protests here were banned. He claimed they were only restricted for one month during the 2005 elections. He also said the government would not consider the demands of the Blue Party. “We will never consider these outrageous demands, they have to give the courts a chance first and should exhaust all legal avenues before shouting in the streets,” Getachew said. Whether the momentum of the Jun. 2 protest can continue is yet to be seen. In the eyes of many Ethiopians, disenfranchised by years of infighting within opposition parties, political and media oppression and rights abuses, the Blue Party is yet another group destined for failure.